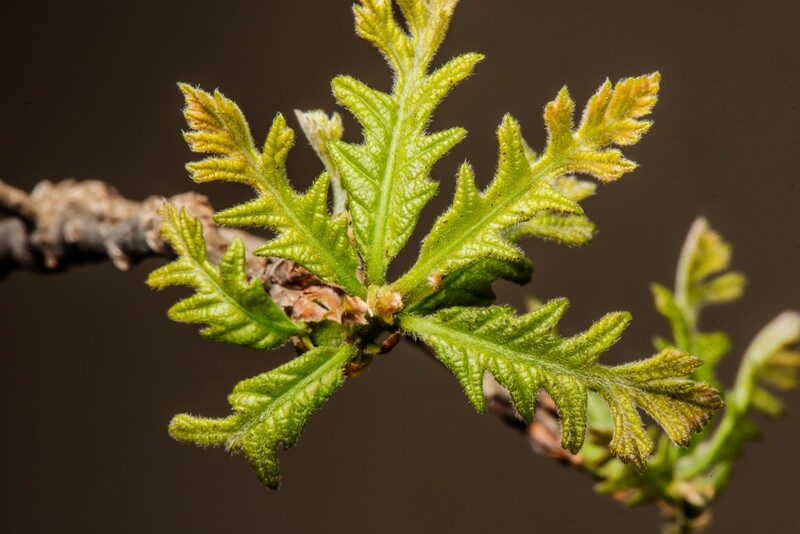 You are here: Home > Stories > Why are young bur oak leaves hairy? Why are young bur oak leaves hairy? Young leaves of bur oak, Quercus macrocarps with dense hairs. Why are the young leaves of so many trees hairy? Here are some possible benefits to hairiness in leaves. There is no reason to think that only one of these explanations is correct. Many organs, tissues and processes in plants serve multiple functions. Development. Leaves develop tightly packaged in a bud. Hairs develop very early, as soon as the leaf starts to develop from a few cells. Hairs may serve to separate layers of cells and keep them from fusing together. Leaves without hairs tend to be folded differently than hairless leaves. We’ll say more about this in a future post. Defense. Hairs can be a significant defense against small herbivores. Mites, beetles and other creatures trying to eat the tasty young leaves are deterred by the hairs. The hairs provide a mechanical barrier to small herbivores, who have to get past the hairs to get at the nutritious leaf tissue. The hairs in oaks are also chock full of nasty chemicals like phenolic compounds that taste bad and are toxic. An herbivore that tries to eat its way through the hairs to get to the good stuff may get a nasty surprise. Protection from sunlight. Leaves are well protected against sunburn from UV radiation by their thick epidermis that contains UV-absorbing chemicals. Young leaves do not yet have a thick epidermis: a thick epidermis would prevent the young leaf from expanding. Hair cells that contain lots of phenolic chemicals absorb UV radiation protect the developing leaf from UV damage while still alowing growth the continue. Reducing water loss. Hairy leaves are more common in desert plants than in plants of very moist habitats. Hairs reduce the rate of transpiration by creating a thicker boundary layer – a layer of unstirred air over a leaf where diffusion slows the rate of gas exchange – over the leaf. For bur oak, this is especially important early in development when the epidermis and stomata are not yet able to fully regulate water loss. I’m sure readers can come up with other explanations for the hairiness of leaves, but these are the most common explanations, supported by some experimental evidence. As the leaf matures and grows, the hairs become more widely spread and wear off. Once the epidermis is fully developed, the hairs are unimportant and gradually wear off, especially from the upper surface of the leaf. Posted in News and tagged bur oak, defense, hairs, leaves, Quercus macrocarpa, trichomes, water relations.